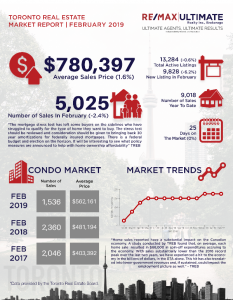 Toronto Real Estate Board President Garry Bhaura announced that Greater Toronto Area REALTORS® reported 7,187 residential sales through TREB’s MLS® System in March 2019. This result was inline with 7,188 sales reported in March 2018. For the first quarter of 2019, sales were down by 1% compared to Q1 2018. The MLS® Home Price Index Composite Benchmark was up by 2.6% year-over-year in March, while the average price for March sales was up by a lesser annual rate of 0.5 % to $788,335. 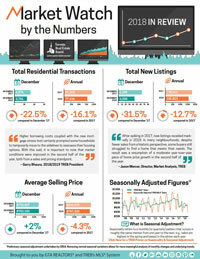 The average selling price for Q1 2019 was up by 1.1% year-over-year.